Exactly 100 years ago today, General Douglas Haig, commander-in-chief of the British Army fighting on the continent during World War I, launched a major offensive in a part of northern France that is known as the Département de la Somme. A département is an administrative district, and this one is named after the Somme, the river that meanders lazily through the area from the east to the coast of the English Channel in the west; during World War I, it thus crossed the line of the Western Front, which ran from the Swiss border in the southeast to the North Sea coast in Belgium to the northwest. On July 1, 1916, the weather was described as “divine,” but that glorious summer day would turn out to be the darkest date in the history of the British army. 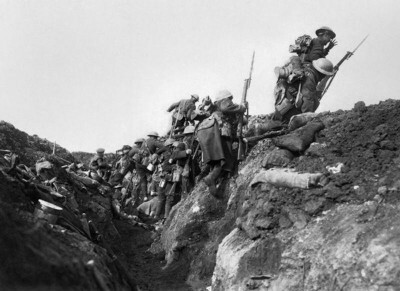 At exactly 7:30 in the morning, the British guns that had been shelling the German positions suddenly fell silent and the “Tommies,” as British soldiers were known, “went over the top” or “jumped the bags,” as exiting the trenches was called. In the case of the Surrey Regiment, an officer kicked a soccer ball into the direction of the German trenches when the attack began, as if this were the start of a game or sports contest. In the minds of the still mostly unexperienced Tommies, this stunt created the impression that the situation was under control, that all would be well. Moreover, the officers had assured the men that they would hardly face any opposition: for five consecutive days, an unprecedented array of cannonry, totalling approximately 1,600 guns, had continuously shelled the Germans, firing about one and a half million projectiles; not much was therefore supposed to be left of the German positions and their defenders. 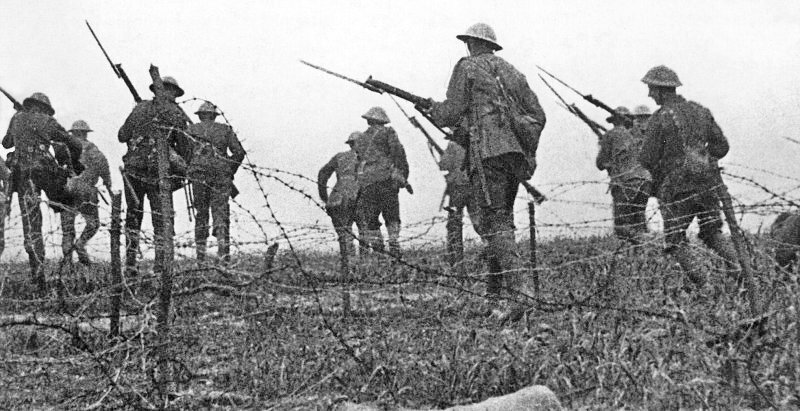 And so the men moved forward through the no man’s land as they had been told, the British way: disciplined and dignified, marching slowly, body upright, shoulder to shoulder. However, the British commanders had not foreseen that all too many German defenders, ensconced in solid tunnels and bunkers up to ten meters deep under the ground, would be able to survive the preliminary artillery bombardment. As soon as the guns ceased to fire, the surviving Germans realized that the attack was imminent, so they rushed out of their shelters with their machine guns. They could not believe their eyes when they saw thousands and thousands of British soldiers approaching through no man`s land, slowly, erect, in neat lines. Countless Tommies were thus mowed down in very little time on that fateful morning. The preliminary shelling, no matter how awesome, had been far less effective than expected because the British shells were of inferior quality, and no less than one quarter of all projectiles fired turned out to be “duds” that did not explode. The waves of British attackers were mowed down, one after the other, by the “meat grinders” (Fleischhackmaschinen) or “sewing machines” (Nähmaschinen), as the Germans called their machine guns. 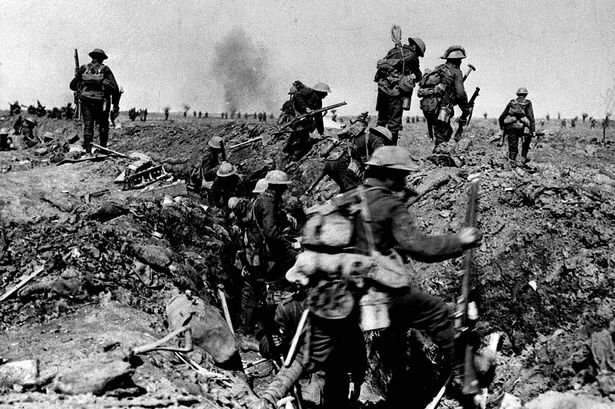 On that fateful “first day on the Somme,” the British Army lost more men than ever before in one single day: approximately 60,000 casualties, maybe more, on a total of 110,000 men who participated in the attack. The German losses allegedly amounted to 8,000 men. The thousands of cavalrymen kept in readiness by Haig waited in vain for the signal to move forward, as the hoped-for breach in the German lines never materialized. The Battle of the Somme started catastrophically on July 1, 1916, but it would drag on until November of that same year, revealing itself to be a Moloch that devoured many more victims. The British ended up registering minimal territorial gains, but arguably more important was the fact that Haig’s scheme had provided some much-needed relief for the beleaguered French around Verdun. In any event, as at Verdun, the losses were enormous. 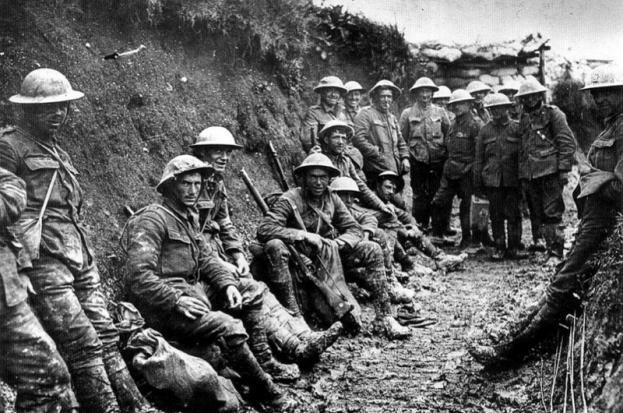 The British suffered casualties totalling approximately a half million men, including at last 125,000 killed, while the French registered 200,000 casualties. The German losses allegedly amounted to about a half million men. To all the forces involved in it, the holocaust at the Somme cost more than one million killed, wounded, missing in action, and prisoners of war. How could tens of thousands of infantrymen so callously be sent to their death on that fateful first day of July? Ever since the 1960s, it has been fashionable to blame General Haig and his colleagues for their incompetence, if not outright stupidity; the British soldiers were presumably skilful and brave enough, but they happened to be a pride of “lions led by donkeys.” However, demonizing Haig and his colleagues, in other words, blaming the massacre on a handful of individuals, does not provide a satisfactory explanation. Indeed, the Great War witnessed too many other similar cases of generals – not only in the British but also in the French, German, and Russian armies – nonchalantly ordering attacks that amounted to a death sentence for tens if not hundreds of thousands of their own men, for example in the Battles of Tannenberg (1914) and the Chemin des Dames (1917). Many of these commanders were skilled professionals, it would be a mistake to dismiss them all as “donkeys.” However, in the armies of all belligerent countries, the officers in general were overwhelmingly “gentlemen,” members of the social elite, and the generals tended to be aristocrats or members of the highest ranks of the upper-middle class (or bourgeoisie) who had internalized the ethos of the aristocracy – as in the case of Haig. It is this class background of the army hierarchs that can help us to make sense of massacres of minions such as the one that occurred on July 1, 1916. The nation must be taught to bear losses…[and] to see heavy casualty lists for what may appear to the uninitiated to be insufficient object[s]…Three years of war and the loss of one-tenth of the manhood of the nation is not too great a price to pay in so great a cause. 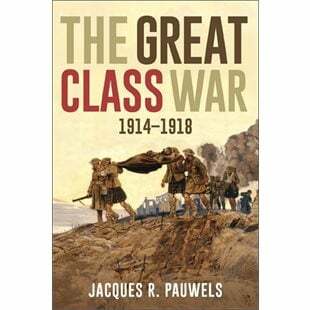 From the perspective of the upper classes within and without the military, the loss of tens of thousands of plebeians was not only perceived to be inevitable, affordable, and rather unimportant, but even beneficial. Like many if not most other members of Britain’s – and Europe’s – elite, a “symbiosis” of the aristocracy and the upper-middle class, generals like Haig perceived the huge numbers of the “lower orders” not only as the cause of proletarian poverty but also as a menace to their own power, wealth, and privileges; from the perspective of the upper classes, the lower classes were what the French called “les classes dangereuses,” “la vile multitude.” The popular “masses” loomed as stupid, aggressive, and dangerous, and simply too numerous, so that the elite welcomed any way in which the number of plebeians in general could be lowered, be made less massive. The solution seemed to be provided by emigration to distant colonies, and, even more so, by Malthusian “positive checks” on the proliferation of the proletariat; these “positive checks” – “positive” in the sense that they increased mortality – included famine and diseases such as tuberculosis, affecting mostly the lower orders, but also war. This war was wanted by the bourgeoisie, the industrial capitalists, and the leaders of all the countries [involved in the war]. They observed the swelling of the ranks of the proletarian organisations and they feared for their coffers. And so they found a solution: eliminating workers by means of war. Not a man shirked going through the extremely heavy barrage, or facing the machine-gun and rifle fire that finally wiped them out…He saw the lines which advanced in such admirable order melting away under the fire. Yet not a man wavered, broke the ranks, or attempted to come back. He has never seen, indeed could never have imagined, such a magnificent display of gallantry, discipline and determination. The report that he had had from the very few survivors of this marvellous advance bear out what he saw with his own eyes, viz, that hardly a man of ours got to the German front line. In other words, the military authorities were pleased that the attack, though murderous, had demonstrated that they had managed to inculcate some discipline and class into proletarians who, during the socially turbulent years leading up to the war, punctuated by frequent demonstrations and strikes, had shown themselves to be restless, unruly, recalcitrant, even rebellious. During the attack they had obeyed orders, nicely lined up, like schoolchildren, then advanced slowly and unswervingly through the no man’s land, erect and dignified, just the way their superiors liked to see it. In fact, in order to make this a fine and enjoyable show for the superiors watching from a safe distance, the attack had been scheduled to take place in full daylight. The British command specialised in throwing men away for nothing. The tradition of an upper class…killed most of my friends as surely as if those cavalry generals had come out of the chateaux with polo mallets and beaten our brains out. Call this class prejudice, if you like, so long as you remember…that I went into that war without any such prejudice, free of any class feeling. ‘T is the rose that I keep in my heart. And what – have you got?